Watch Something Rotten! stars Brian d'Arcy James and Christian Borle perform on The View. Richard Harris ’76, a Washington, D.C., freelance writer, was a senior producer for ABC News Nightline and director of afternoon programming and news anchor at NPR. From Something Rotten! On Broadway to the movie Spotlight on the big screen, Brian d’Arcy James has proved that he is a versatile actor, a talented song and dance man and one of the nicest guys in show business. Two days before this year’s nationally televised Tony Awards, director and choreographer Casey Nicholaw put the cast of the hit Broadway musical Something Rotten! through their paces. It was a full camera rehearsal at Radio City Music Hall for the coveted opening production number, a rare opportunity for a Broadway show to strut its stuff before more than 6 million people. It was also a chance for the show’s star and one of the most versatile actors on the New York stage, Brian d’Arcy James ’90, to reintroduce himself to the country. “Well, that is the … Stupidest thing I have ever heard. After four takes, the six-minute showstopper, cleverly embedded with references to more than two dozen famous musicals, was close enough to flawless. And Nicholaw took a moment to kvell over the man who carries much of the show on his back. Apparently, nice guys don’t always finish last. James is in such demand these days that he faced an embarrassment of riches and “the toughest professional decision of his career” last spring. Would he remain as King George in the hot off-Broadway musical Hamilton, what he called “a gem of a role in an extraordinary piece of theater,” or take a flier on dancing omelettes and a journey into the absurd as the lead in the original musical Something Rotten!? Omelettes and absurdity won out, but as workshops started, James had to rush to Boston to shoot a scene for the upcoming feature film Spotlight, his first major movie role (watch the trailer). It has been the most pressure of James’ 27-year career, especially one four-week stretch in June without a day off. “Exhausting but thrilling,” James says. Mere mortals might say “grueling.” Among James’ secret weapons: a personal trainer to help him conquer 16 performances in a row without a break, each requiring the limber James to command the Something Rotten! stage for no less than 100 of the show’s 120 minutes. And just to ensure he had no time off at all, James committed to a series of Monday night appearances (his usual day off), including a benefit reunion performance with his colleagues from the NBC TV musical drama series Smash (2012–13). 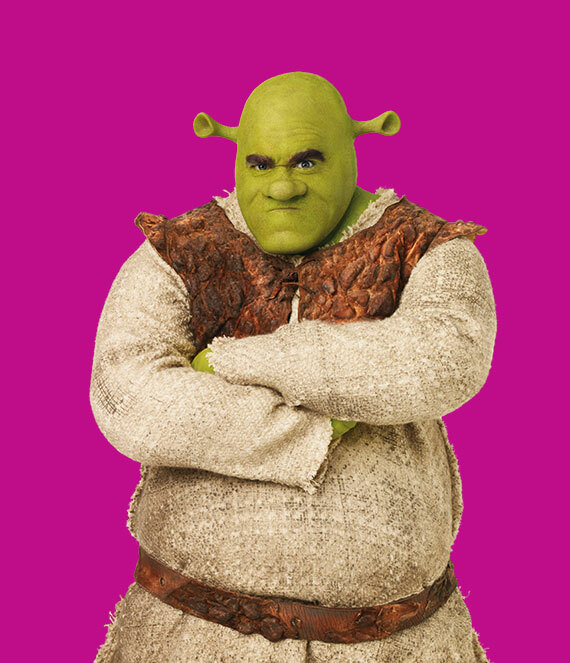 Brian d’Arcy James played the title character in the original Broadway cast of Shrek the Musical in 2008–09. Photo by Andrew Eccles. Watch as costume designers transform James into a monster. In his dressing room, just offstage after a Wednesday evening performance — his second that day — James seemed more relaxed than spent when greeting 91-year-old fellow Northwestern alumnus Sheldon Harnick ’49, the Fiddler on the Roof lyricist, and his wife, Margery. It’s remarkable enough to receive raves from the likes of Dame Helen Mirren, who’s been among the celebrities spotted at Something Rotten!, but equally flattering to have the legendary lyricist stop by, effusive in his praise for both the show’s lyrics and James’ performance. One look around his dressing room and it’s clear James wants to surround himself with reminders of the people who helped him along the way. There’s the picture of his namesake and uncle, the late actor Brian Kelly, who starred in the 1960s television series Flipper and advised James “never act with a fish,” and the prized family heirloom on a shelf, a typewritten note James’ grandfather prepared for his father that James treasures: Polonius’ advice to Laertes from Hamlet — “to thine own self be true,” words that James actually speaks and sings in his current production and may also speak to James’ authenticity as an actor. By the time James emerges from the stage door onto 44th Street, it’s past 11 p.m., when the nightly throng of fans, behind stanchions and velvet rope, erupts with excitement, waving Playbills and posters for autographs and hoping for selfies with the star on their smartphones. Then on to his Upper West Side apartment for a quick night’s sleep before a 7:30 a.m. call at the ABC studios off Central Park West, where he gets wired up for a camera rehearsal for a segment of The View to tape that afternoon (see the entire interview and performance). It’s a scene where his character, Nick Bottom, has an idea for a play that could vault him past the Bard to fame and fortune. Nearly 30 years later, with his actress wife, Jennifer Prescott, and 13-year-old daughter, Grace, James is on his way to doing just that, though he also wonders where “the wild passion of an artist’s spirit” was in his answer. After his students graduated, Beyer didn’t make a habit of trekking to New York to see them perform. But he made an exception for James, surprising him during his first Broadway production, Blood Brothers (1993–95). “I went to the show to see Brian because I knew he was going to be someone incredibly special.” There, Beyer presented his former student with a Swiss Army pocketknife. One of Beyer’s admonitions has stuck with James throughout his career. “Your job is auditioning,” Beyer reminded his students. Nor was Mike Nichols enthralled when James unsuccessfully auditioned for Spamalot by singing a song from the TV show Hee Haw. A critical moment in James’ coming of age onstage came just after his 20th birthday, between his sophomore and junior years at Northwestern, when he was cast as Claude, the lead in the 20th anniversary production of the ’60s rock musical Hair at Chicago’s Vic Theatre. The role meant that he had to leave school for the fall quarter to go pro in the musical revival, which was adapted from a production he performed at the University. Dominic Missimi, who directed both the campus and professional productions of Hair and worked with James on the Waa-Mu shows, says “there have been several times in my teaching career when I look at the performer in front of me and go, ‘Oh my God, this person is special, not like other people.’” That happened James’ freshman year, when he appeared in a major role in The 1940’s Radio Hour. James’ Northwestern credits included With a Twist, the 1987 Waa-Mu Show, which also featured Susan Bachman Rovner ’88. 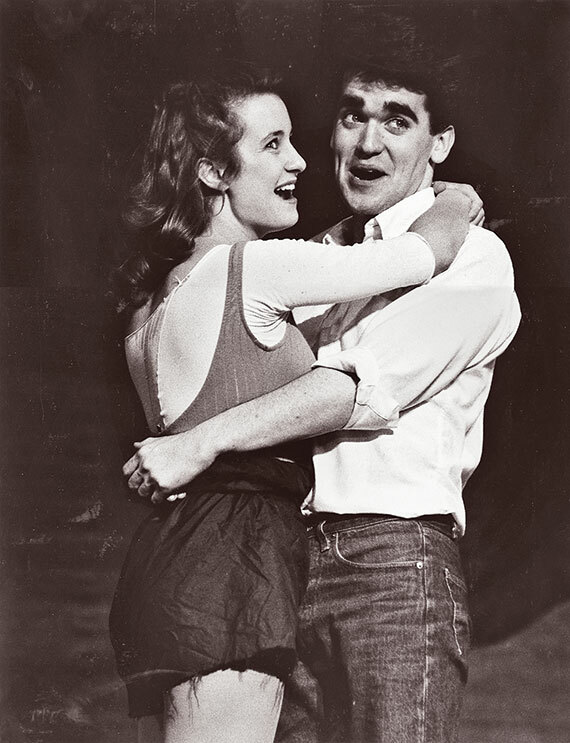 See more photos from James' days as a Northwestern theater star. Photo courtesy of the School of Communication. Even before James arrived at Northwestern he had landed community theater gigs during high school. A 16-year-old James took the stage of Saginaw’s Pit & Balcony and wowed Jim Gaertner, who was holding auditions for a production of Annie. “I looked at my musical director and asked, ‘Do you see what I see? We have to find a role for him.’” And they did, as Rooster, and during the three-week run, James’ dad didn’t miss a single performance. “I told his dad to quit buying tickets and just sit in the back with me,” Gaertner recalls. Thomas James’ support for his son’s passion for performing went beyond parental attendance. He would pass on newspaper clippings of upcoming auditions, including one for Joseph and the Amazing Technicolor Dreamcoat in nearby Midland. There, Dean Badalato, who was in the original company of A Chorus Line and had ties to Midland, ended up directing James, an 11th-grader, as the lead in the professional production. Badalato told the Saginaw News that “this kid could have a Broadway career if he wanted to.” For James, it was a transformative moment, the first time any professional had given him a public thumbs-up. “It made a huge impression on me,” says James. And nearly 30 years after that experience, James invited Badaloto to the opening of Something Rotten!. 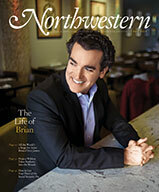 For the kid from Saginaw, who channeled Billy Joel at 13, took on Annie at 16 and immersed himself in what he calls “the science of acting” at Northwestern, there appear to be no barriers in the theater world or across any media that will hold Brian d’Arcy James back. Few actors avoid being typecast. James has spent his professional life making sure he won’t be. And his manager, J.B. Roberts ‘89, once his pledge trainer in the Sigma Chi fraternity at Northwestern, expects James to have a long and varied career. 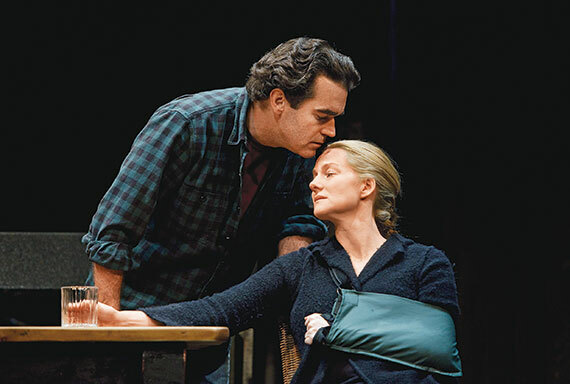 Brian d’Arcy James and Laura Linney in Time Stands Still during the production’s 2010 Broadway run. Photo by Joan Marcus. “There are very few people who can play an investigative reporter in the film Spotlight, be Shrek on Broadway and play opposite Laura Linney in Time Stands Still [2010–11],” one of James’ favorite roles. James has also dabbled in cabaret at New York’s 54 Below, though he felt slightly exposed and says he prefers to do his singing while hiding behind a character onstage. On James’ career bucket list: produce theater (taking a page from his days co-chairing the Waa-Mu Show), do Shakespeare in the Park at the Delacorte Theater in New York’s Central Park and turn a music album into a theatrical production. For James, any professional success is fueled by family support. James’ mom, Mary, attended opening night of Something Rotten!. And his sister Anne James-Noonan, who teaches acting at Winnetka’s New Trier High School, was part of the family delegation that accompanied James to this year’s Tonys. A bulging résumé and raft of awards often equal a swellhead, but James’ wife, Jennifer (whom he met when the two appeared in a 1994–95 Lincoln Center production of Carousel), swears “there’s not a diva bone in Brian’s body.” She says all of his siblings — including Kate, a comedy writer and performer in Chicago, and Andrew, a senior portfolio manager at the University of Chicago — share a common trait: They’re positive and confident. “Remarkably,” she says, “Brian has never stopped working as an actor, never had to wait tables in the early years,” even if it meant acting in corporate shows to put money in his pocket. Brian d’Arcy James still gets emotional, thinking about his dad, “especially now that I’m a father and getting the chance to share things with my daughter.” Thomas James has been gone more than 20 years, but a note he shared with his son many years ago remains one of Brian’s prized possessions. It tells you what a few encouraging words from a father to a son mean and how they can motivate. “As long as they are your career goals, you will always succeed,” the note reads. “And the word ‘your’ is underlined a couple of times,” says James.